Four of the seven candidates for Florida Senate District 38 showed up for the debate held at Miami Beach Senior High School. Tuesday night, candidates for the redrawn Florida Senate District 38 debated each other on where they stand on various issues from how they feel about aerial mosquito spraying in light of the Zika outbreak to the increase in property insurance rates and the merits of increasing the minimum wage. The debate was organized by Benjamin Burstein, president of Unified Democracy, a political action committee dedicated to getting more young people involved in the civic process. 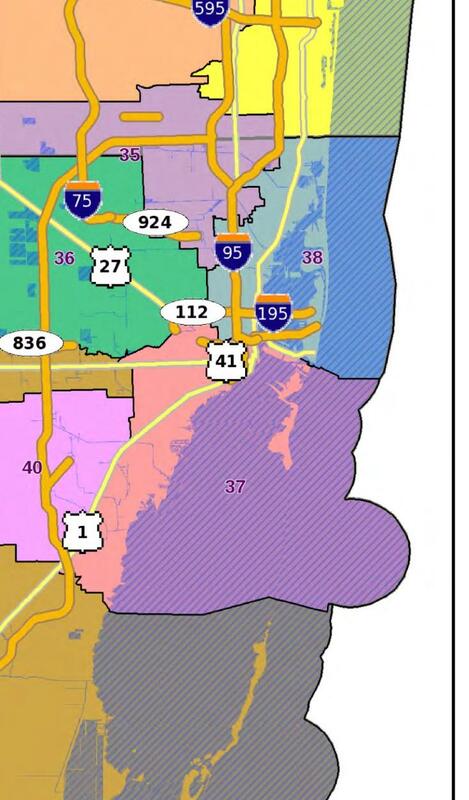 The newly redrawn Florida Senate District 38. According to Burstein, all seven candidates said they were going to come, but only four showed. Benjamin Burstein moderates the debate at Miami Beach Senior High School. The candidates who showed up were Kevin Burns, former mayor of North Miami; Don Festge, a high school teacher; Michael Gongora, a former Miami Beach commissioner, and Jason Pizzo a former assistant state attorney. Two podiums for Anis Blemur and Phillip Brutus were left empty on the stage. Daphne Campbell, a representative in the Florida House, was also absent from the debate. The four who attended plus Blemur and Campbell are all Democrats and will face each other in the Aug. 30 primary. The winner will face Brutus, a former Democratic state representative who is running as a no-party candidate, in the Nov. 8 general election. No Republican filed to run in the district. Most of the four present, who spent two hours articulating their positions, admitted there wasn’t a whole lot of difference in their views on the issues. They did, however, hold up experience or passion as what set them apart in their ability to get things done up in Tallahassee.